I normally like to create and post “polished” videos – but then there are times like this where I want to show you something that is so super quick I just can’t wait – such is the case on this post about creating an Embossed Lettering design. 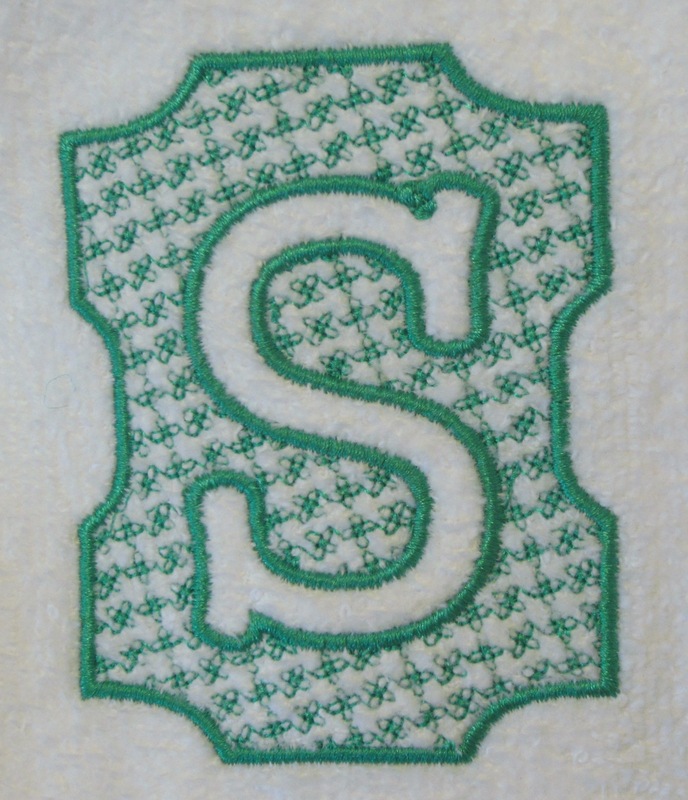 Do you like Embossed lettering style embroidery? 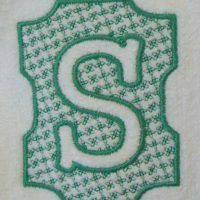 In StitchArtist, all you need to create an embossed letter is the object that is the shape of the frame and the letter that you want to be the hole in the embossing. As you can see below, I created the letter “E” from a True Type Font and sized it to be the size I wanted. 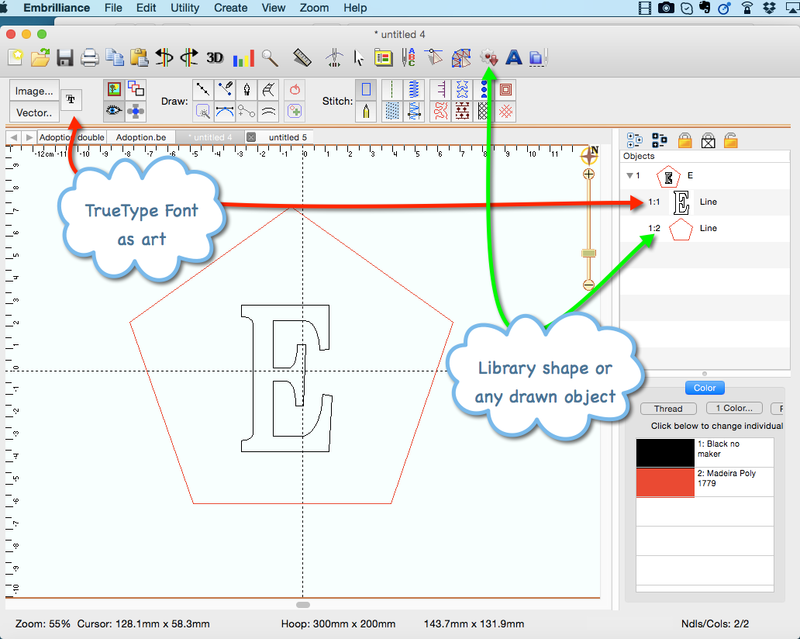 This shape is from the library of built in shapes but you can create your own as ornate or simple that you want. The best “style of font” for this type of project is a thick chunky font – one that has specific open areas that can be defined by a void in the stitching. Using a thin script style font is not an effective choice. The thinner the font, the smaller the embossing pattern needs to be. If you choose a really open pattern, you will not be able to see the letter very clearly. Simple fat non-ornate letters work best. Let the background motif you choose for the embossing be the headliner and play center stage in this project. So the two objects are inside each other – they kind of look like what I want my embossed letter to look like so all I need to do is add the hole in the shape of the E to the polygon shape. This is so easy to do in StitchArtist that I created a 60 second video showing you how to do this, apply a motif fill AND add a satin border around both the outer and inner edges. 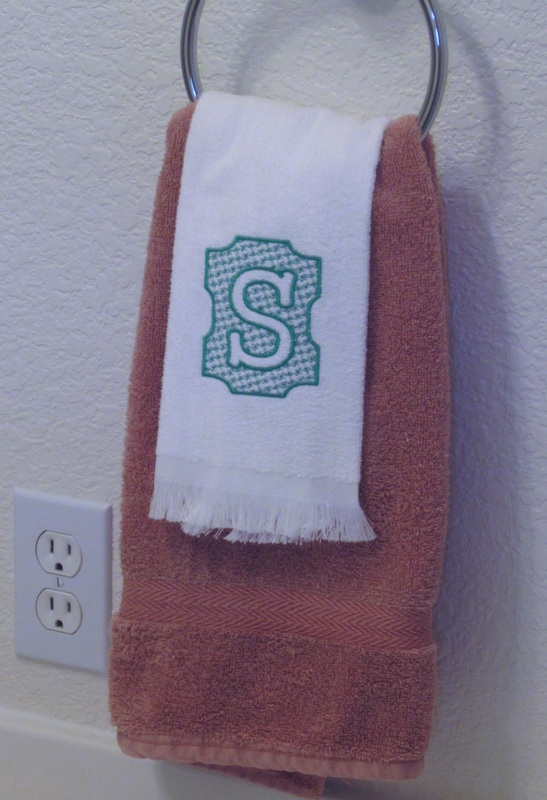 Now if you are not familiar with StitchArtist, here is the link to the information page. 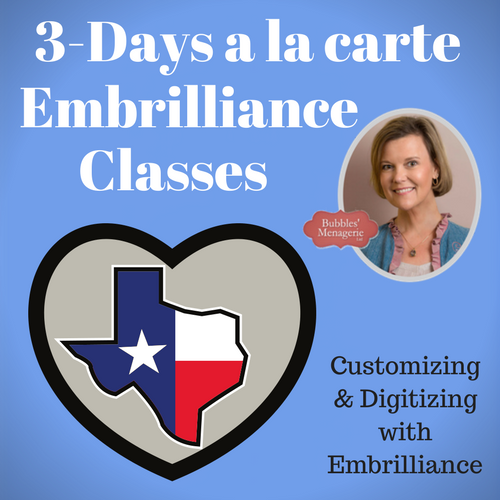 Although I am in Level 2 in the video – this can be done in Level 1 for those that are just getting into digitizing. Click Here for the StitchArtist Information page – click on StitchArtist in the left column to read all about this value priced SUPER DUPER EASY software! ← Spam – horrible waste of time! !